My work mate recently bought an iShower and was going on and on about it, he talked me into buying one for myself. I agreed, and wanted to check it out, to see what all the hype and fuzz was all about. So I bought an iShower on line not knowing what it actually was, but I soon realized the functions and features of an iShower and was truly amazed. The iShower is a water proof speaker that is Bluetooth enabled and compatible with most Bluetooth enabled tablets and smart-phones. It works best with Apple products and all Android devices. Can stream audio files from other apps. Bluetooth range up to 200 feet. Can be paired with five users. Works with most devices with Bluetooth. Play, back, forward and pause functions. The iShower can be mounted in multiple ways. Best when used with Apple products. Compatible with most Android gadgets. Dual speakers built in with a splash proof receiver (wireless). Audio jack and in cable option is available. Can transmit audio frequencies for 150 feet through floors and walls. The handle that holds the speaker can be rotated ninety degrees when affixed. Auto On and off is available, along with bass boost and auto scan. The iShower is also incredibly flexible, when it comes to pairing devices, that is right up to 5 devices or gadgets can be paired to the iShower and can be used at the same time. The one important feature of the iShower that makes it outstanding is that you can stream music from all the five devices that are paired. The iShower being water resistant, you can play it while having shower (Not advisable, tried it but could only hear the water gushing out of the shower more), can use it in the lake while fishing, or while you are swimming in the pool. The iShower is the perfect device to take out, if you have plans on spending a day at the beach with family and friends. Listening to NPR (National Public Radio) has become a habit of sorts, all the major radio stations across North America can be tuned in and the sound quality is so crisp and clear. I can also connect my iPhone,iPad and iPod touch to the NPR app. The additional bonus feature is that it is possible to skip music from other devices using iShower. 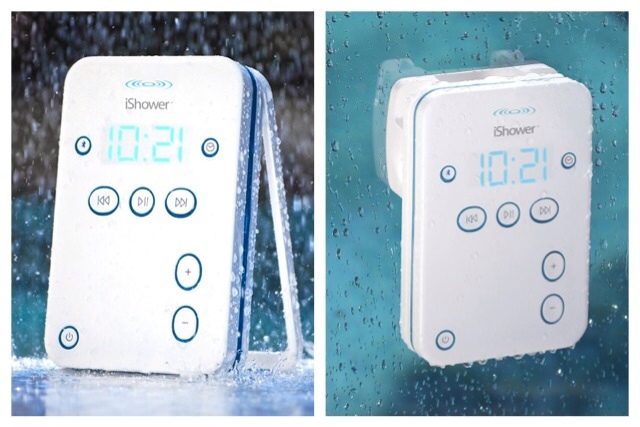 The iShower has a digital clock and the Bluetooth button on the left of the clock, on the right side of the clock display there is a clock timer button. Directly beneath the clock you have the skip and rewind button is given on the left, and in the middle you have the pause and play button and to the right you will find the skip and forward button. On the right hand bottom the volume increase and decrease buttons are placed vertically, and on the left corner you will find the power button. If you flip the iShower on the back side you will find a sturdy stand, (like the ones used behind a photo frame). There is also the option of sticking the iShower to any wall including the inside of your shower cabinet, and is easily removable and can be stuck or placed elsewhere without leaving gum marks on walls. For battery back up the normal AA batteries can be used as well as a charger is provided and can be connected to a power source. The Bluetooth connectivity range is simple superb it can connect to a phone or any other device placed in the garage or the basement and there is never a brake in the connectivity if you place the iShower in the bathroom upstairs. The iShower is a medium sized gadget and measures at 10.62” x 4.52 x 2.75 by 270mm x 115 x 70. The verdict is the iShower is a unique product that we do not come across very often and is a must have Apple product, that is reasonable and priced at $100. 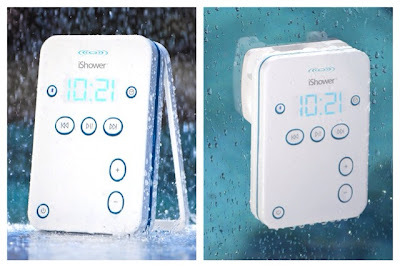 This product is worth 4 and a half stars, would have given it a full five stars if the iShower could be connected to an iPod dock and the power button has to be pressed everytime for the clock to be displayed.